With players Hotshot, MaJes7ic and 24K DropOff, has the guy in the violet Afro created the best big three since D-Wade, LeBron and Bosh? Four years ago, when Derric Franklin returned from Afghanistan, where he’d been deployed by the U.S. Army, he picked up NBA 2K15 and began playing the game with a virtually created avatar. The only thing is, he didn’t know to change the avatar’s name, “Russ Snow,” or its physical appearance, a 7-foot-3 center with a massive purple Afro. But he let it rock, even as he became more well-versed in the game, and people took notice. By 2016, he began operating under the persona “Famous Enough” as a way to embrace talented players whom the game cultivates worldwide. “ I wanted to let them know,” he said, “that they were famous enough to get the credit they deserve.” Via YouTube videos and a strong Twitter presence, Franklin became a fixture in the 2K community as “Famous” — a source of news and an evaluator of skill. But even as his profile expanded, Franklin continued to channel his inner Russ Snow. 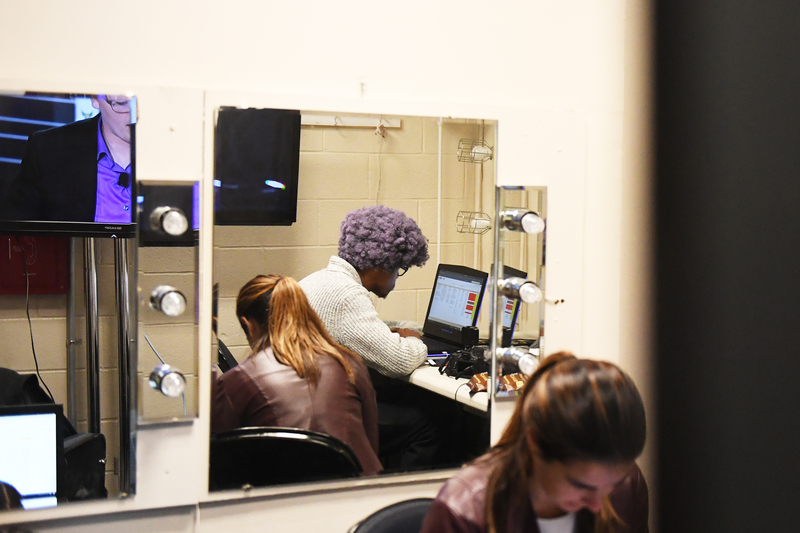 He dons a purple ’fro at every 2K event — and this one? It’s his biggest yet. NEW YORK — It’s an uncharacteristically dreary spring morning in Manhattan, and Derric Franklin pulls up at Madison Square Garden earlier than most. In the sea of suits that begin to fill the arena, he stands out: button-down shirt, gray cardigan, dark blue jeans and freshly unboxed Game Royal Air Jordan 1s. 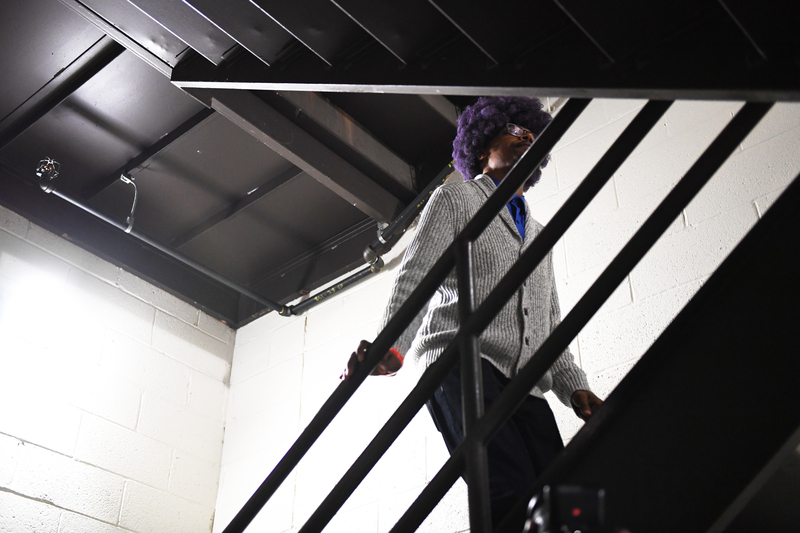 The crown jewel of his ’fit is a custom Afro wig, dyed a faint violet and picked out in all its glory. “This is me,” he says after climbing an MSG escalator that leads him to the lobby of the Hulu Theater. The ’fro is a trademark of Franklin’s swag in the NBA 2K community. And among tastemakers surrounding the most revered basketball video game in gaming history (and its most popular mode, the 5-on-5 Pro-Am gameplay), the 6-foot-4 Famous is something of a Don Corleone. Famous knows everyone — including players, streamers and league creators — and everyone knows Famous. This realm is his element, and in his element he commands the utmost respect. “Today is the day,” he continued. “I had to tell myself, ‘Oh, s—, this is real.’ ” It’s April 4, 2018, and the draft of the inaugural season of the NBA 2K League has finally arrived. Professional gaming squads from 17 of the NBA’s 30 teams are gearing up to select from a crop of the best players on the planet. Beginning in May, the season will consist of weekly matchups and monthly showcases, all leading to the postseason in late August. 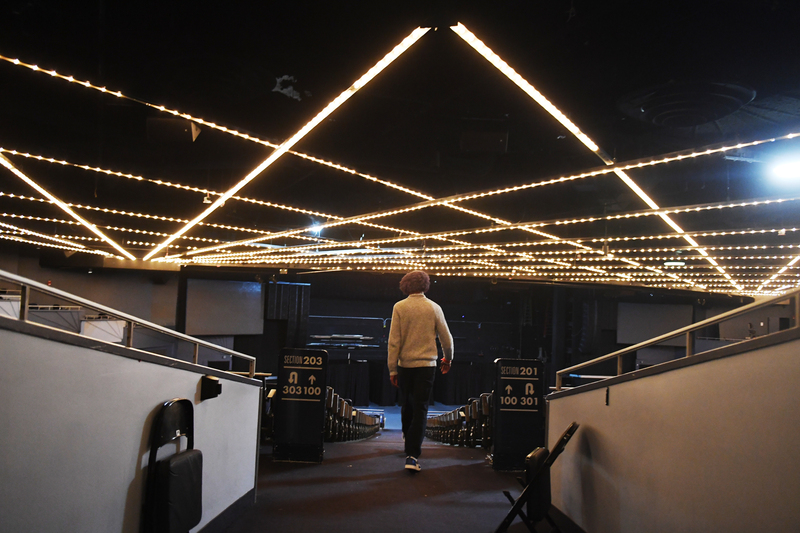 Miami Heat Check Gaming coach Derric “Famous” Franklin climbs the stairs to the war room during the first ever NBA2K League Draft on April 4, 2018 at the Hulu Theater at Madison Square Garden in New York City, NY. For those a part of this world, this moment has been a long time coming. Back in February 2017, the NBA announced a partnership with Take-Two Interactive, 2K’s publisher, to bring the league to life. Since then, the latest installment of the series, NBA 2K18, became 2017’s top-selling sports video game, despite being released in mid-September, and is ranked behind only Call of Duty: World War II in national sales. The game is a multicultural phenomenon, and it just got bigger. Famous is running on the fumes of a mere three hours of sleep, though he doubts that anyone else in the building has studied the field of talent — which went from 72,000 gamers to 250 to a final pool of 102 — more than he has. As team operations coordinator (basically, general manager and coach) of the Miami Heat’s squad, he’s had full control of Heat Check Gaming’s draft strategy since he joined the organization in February. The hire came after initial talks with Sacramento’s Kings Guard Gaming, Portland’s Blaze5 Gaming and Washington’s Wizards District Gaming. For some reason, he went 0-for-3 in each of those interviews. “It’s definitely something that isn’t going to be forgotten,” he says of the teams that passed on him. Of the 17 teams in the first season of the league, Franklin is the only black leader. HotShot, MaJes7ic and 24K Dropoff are Miami’s best big three since D-Wade, LeBron and Bosh. After the draft, the six players whom Famous selects will put in two weeks’ notice at former day jobs and uproot their lives. They’ll sign contracts, which include medical insurance and retirement plans, with the Miami Heat organization, worth more money ($35,000 for the first-round pick and $32,000 for players taken afterward) than what the NBA’s G League players make. Heat Check gamers will then move into new apartments in Coral Gables, Florida, where the team’s gaming room is on its own level. And for the next five months, they’ll compete for a $1 million prize pool, spread out over three in-season tournaments and the playoffs, with one goal in mind: a championship. Famous embraces the pressure of being the head of a franchise and architect of a roster that needs six MyPlayers: a point guard, shooting guard, small forward, power forward, center and sixth man. And his confidence is oozing. “I’m gonna control the draft,” he said. “Things are gonna go the way I want. No other way.” Imagine this is the game itself for Famous. He grabs the rebound off the glass and leads the break up the floor. Now, it’s just time to score. Heat Check Gaming’s war room is a cramped dressing room, deep in the bowels of Madison Square Garden. Inside, Famous sits at his bulky Dell Alienware laptop, scrolling up and down a color-coated Excel spreadsheet that he spent countless hours perfecting. Ever since the 2K League finalized the very multicultural-appearing group of draft-eligible prospects, many who are attending the event in New York wearing new suits purchased on the league’s dime, Famous went through scenario after scenario, simulating selections. Derric “Famous” Franklin goes through his draft order before the round begins. At 1:33 p.m., Silver calls the name of Artreyo Boyd, an e-point guard from Cleveland known as “Dimez,” as the No. 1 overall pick of Dallas’ Mavs Gaming. That’s right, the commissioner who announced Andrew Wiggins, Karl-Anthony Towns, Ben Simmons and Markelle Fultz as top picks in the NBA sticks around to welcome the first player to be taken in the 2K League. That’s how real this thing is. “It’s a blessing, man. I’ve worked so hard,” Boyd says onstage. “I’ve been playing for a very long time.” Before Dimez became arguably the best 2K player in the world, with a massive multiplatform following, Famous encouraged him to expand his skill set and brand outside of GroupMe conversations with fellow players by marketing himself in relevant ways. With Dimez off the board, the league’s first draft has officially begun. Famous doesn’t watch but simply listens to the 50-inch TV mounted above him as Boston’s Celtics Crossover Gaming and Utah’s Jazz Gaming make their decisions. And just as he prophesied, the top three teams take a point guard. By the seventh slot, no one has sniffed out Famous’ strategy, so he gets his guy: Juan Gonzalez, aka “Hotshot,” a Miami native who’s “definitely in the conversation for the best center of the game,” said draft commentator/league analyst Jamie “Dirk” Diaz Ruiz. Meanwhile, Heat Check’s top choice collects his draft cap and walks onstage to pose in front of flashing cameras with league managing director Brendan Donohue. “It’s such an honor,” says Gonzalez, his hands still shaking after a circuit of interviews, “that it doesn’t feel real. I wanted to go to the Heat. I wanted to play for my hometown team.” The vibe is nearly identical to what any real NBA player experiences after being drafted. Flashing cameras and nonstop interviews. Congratulatory handshakes and salutes from every direction. Brewing trash talk between fellow picks — who would fire up the game right then and there to go at it on the sticks. 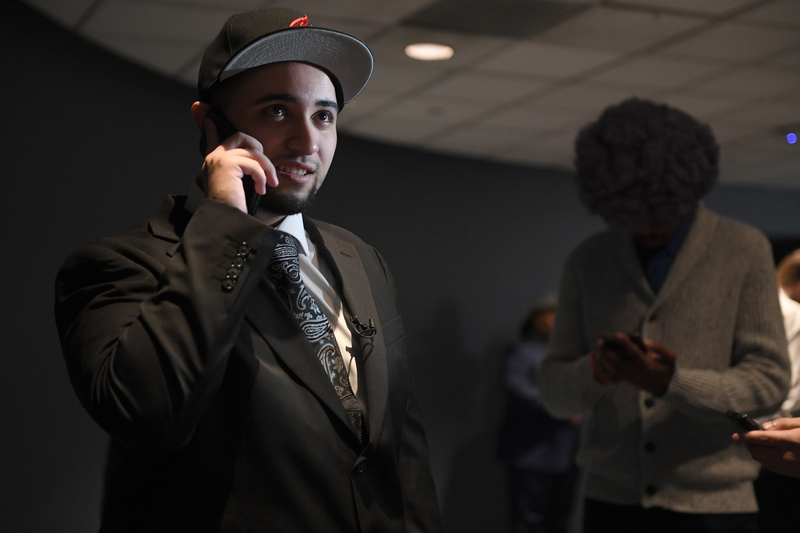 Heat Check Gaming’s first draft pick Juan Gonzalez aka ÒHotshotÓ calls his mother after being drafted while coach Derric “Framous” Franklin waits to welcome him during the first ever NBA2K League Draft on April 4, 2018 at the Hulu Theater at Madison Square Garden in New York City, NY. Famous claps after picking up MaJes7ic during the second round of the NBA2K League Draft. Famous appears and interrupts Gonzalez with a huge hug. “After the pick, I cried,” he says to Hotshot, who’s still beaming. The brief moment ends with Famous jogging back to his post, where he’s cracked open a fruit tray to fuel him through the next five picks. Next to his computer is the phone he uses to call in his selections to a league representative when it’s Heat Check’s turn to draft. Early on, he establishes a streamlined system for himself: pick up the phone, hit redial and say a name. No time wasted — that’s how certain he is of his choices. There’s quite a bit of time, though, until he must make another decision. A snake-style drafting format means Heat Check must wait 11 picks before its second selection. And as Donohue announces name after name, there’s one that, shockingly, remains uncalled. Stanley Lebron (yes, that’s his real last name), known on 2K as MaJes7ic (pronounced Majestic), would’ve been the top-ranked shooting guard in the draft class but qualified as a point guard at the combine. Hotshot notices Lebron continuing to fall, pulls out his iPhone and dials Famous. “TAKE MAJES7IC!” he blurts out before his coach hangs up on him. Famous already knew what to do. With the No. 28 overall pick at the end of the second round, Heat Check lands the talented combo guard. “This guy should’ve went in the first round,” says Famous, standing next to Lebron. “When he got there, I was, like, there’s no way I could pass on him.” Of the eight pre-draft interviews he conducted with gamers, Famous hadn’t even bothered wasting MaJes7ic’s time because it just didn’t seem feasible for him to still be there so deep in the draft. He continues raving about the second-round pick to members of the Heat staff: communications manager Lorenzo Butler, marketing manager Clara Stroude-Vazquez, videographer Edwin Jean and senior director of interactive media Lauren Cochran. They’re a dedicated crew who all made the trip up from Miami. “I’m Dominican,” Lebron says with a smile. He’ll fit right in. The shooter hails from Queens, New York — but the Heat is his favorite NBA squad. 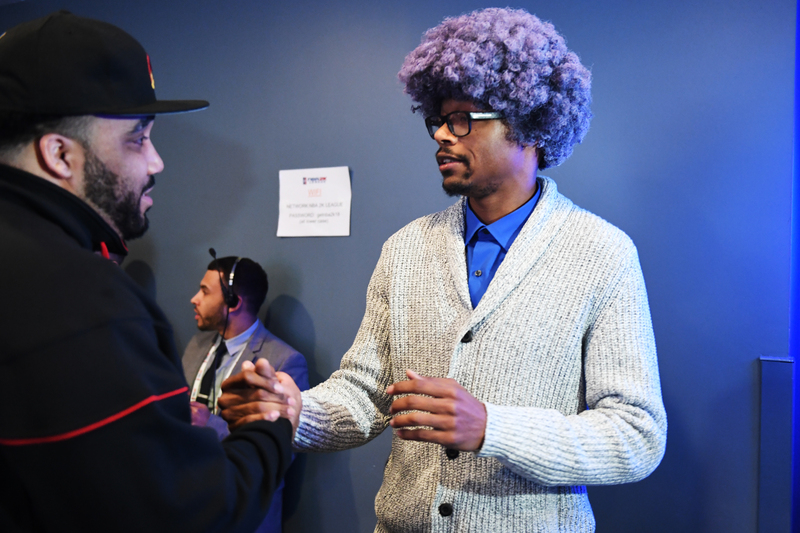 Derric “Famous” Franklin greets Basil “24k Dropoff” Rose after drafting him during the first ever NBA2K League Draft. Don’t get it twisted, though. 24K DropOff is no compromise for Heat Check. Famous interviewed him before the draft and placed Rose’s name high on his board. Of 72,000 players who participated in the combine, Rose emerged as the only one to average a triple-double (17 points, 14 rebounds and 10 assists). Hotshot, MaJes7ic and 24K DropOff are Miami’s best big three since D-Wade, LeBron and Bosh. And DropOff is certainly the alpha of the bunch — outspoken and super wavy, as they say north of the U.S. border. As for how he feels about playing for the league’s only black coordinator? Stop it, Famous … just stop it. These are the whispers in the room, but as the draft rages on, he keeps splashing jumpers with his selections. In the fourth round, he takes “sharpshooterlos,” a skilled small forward from Reading, Pennsylvania. “I thought Miami was the last place on Earth I was gonna land,” said Carlos Zayas-Diaz. “But, man, this is a dream come true. I got the best team in the league.” The fifth round yields a shooting guard in “Jalen03303” Jones, who didn’t make the trip to the Big Apple from his hometown of Bossier City, Louisiana. 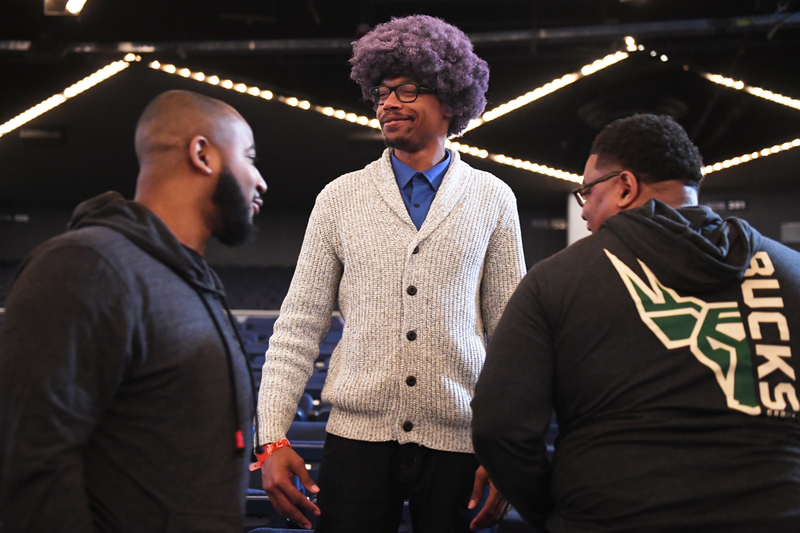 Derric “Famous” Franklin walks back to the war room after the third round of the first ever NBA2K League Draft on April 4, 2018 at the Hulu Theater at Madison Square Garden in New York City, NY. The new faces of Heat Check Gaming gather in the first two rows of the theater’s auditorium for their first team meeting. “We’re gonna run, we’re gonna score a lot of points and we’re gonna play tough defense,” says Famous, while his players listen intently as their fearless leader delivers an Any Given Sunday moment. “We’re gonna go win a championship,” he continues, “because I feel like we got the best team.” Famous adds a little more weight to the statement.